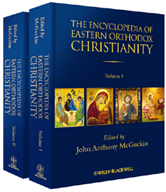 With a combination of essay-length and short entries written by a team of leading religious experts, the Encyclopedia of Eastern Orthodoxy offers the most comprehensive guide to the cultural and intellectual world of Eastern Orthodox Christianity available in English today. An outstanding reference work providing an account of the key historical, liturgical, doctrinal features of Eastern Orthodoxy, including the Non-Chalcedonian churches. Explores of the major traditions of Eastern Orthodoxy in detail, including the Armenian, Byzantine, Coptic, Ethiopic, Slavic, Romanian, Syriac churches. Uniquely comprehensive, it is edited by one of the leading scholars in the field and provides authoritative but accessible articles by a range of top international academics and Orthodox figures. Spans the period from Late Antiquity to the present, encompassing subjects including history, theology, liturgy, monasticism, sacramentology, canon law, philosophy, folk culture, architecture, archaeology, martyrology, hagiography, all alongside a large and generously detailed prosopography.